Comparative negligence in bicycle accidents involves a rider who is partially to blame for the cause of a collision. In Massachusetts, comparative negligence is not necessarily a bar to recovery, but it may limit the amount of damages one can collect. So even if you are cited in a bike crash that resulted in serious injury, do not assume you don’t have a case until you speak with an injury attorney. According to a recent news article from the Newburyport Daily News, a man from Chelsea was airlifted to the hospital following a serious bicycle crash involving a car. Authorities have said the 41-year-old bike rider was riding along with a woman at around 10 p.m. The couple was riding their bicycles when the bike crash victim collided with a motor vehicle that was traveling in the same direction. The driver of the vehicle immediately came to a complete stop and waited for first responders to arrive. When first responders arrived, they did everything every they could to stabilize the bike crash victim prior to putting him on a medevac helicopter to a local level one trauma center in downtown Boston. The accident is still under investigation, but there have been no criminal charges filed and there was no indication that either the driver or the vehicle or the bike rider were under the influence at the time of the bike crash. It was noted that there were lights on the victim’s bicycle, but the lights were not illuminated at the time of the accident. 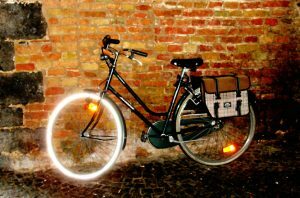 As our Boston bike crash lawyers can explain, Massachusetts General Laws (MGL), Chapter 85, Section 11B provides that all bicycles must be equipped with a white headlamp and red tail light that must be illuminated one-half hour after sunset to one-half hour before sunrise. Bike riders are also required to have a reflector on the peddles of his bicycle. However, since many bike riders to not have traditional pedals, and instead use clips that lock into special bike riding shoes, there would not be a place for a traditional pedal reflector. If a rider does not have traditional pedals, he must have reflective material around his ankles that are visible in the front and rear of the bike at a distance of at lease 600 feet. This is only a minimum requirement and law allows for any additional safety lights and reflectors the bike rider chooses to wear. It is generally a good idea to wear additional reflectors and use additional lights. If a bike rider violates any of these required safety protocols, the statute provides for a small fine. This doesn’t mean that an injured cyclist was not who was not fulfilling one of these safety requirements will be without recourse, but it will bring up some issues that will be discussed in more detail below. If a bike rider was hit by a car and the driver was at-fault, there could be the issue of the bike rider not having her lights illuminated when riding after sunset and before sunrise, the bike rider could also be considered negligent – or at least partially negligent. There is a special statute that address the issue of when both plaintiff and defendant are considered negligent. That statute is found in Chapter 231, Section 85 of the MGL. It addresses comparative negligence, and the limited effect of contributory in the Commonwealth of Massachusetts. At common law carried over from the British legal system, if a plaintiff was even one percent negligence in connection with the accident that resulted in his injury, it would be a complete bar to recovery. For example, a if a bike rider was riding his bike after dark without a head light or tail light and there was a law requiring him do so, and that was in any way responsible for the bike crash, then plaintiff would be barred from recovering anything in a bike accident lawsuit. Jurisdictions that follow this system call it a pure contributory negligence law. Fortunately, there are only a handful of jurisdictions that still follow a pure comparative negligence system and most are located in the mid Atlantic region. Even those states have a way to get around that using what is known as the last clear chance jurisdiction. Massachusetts does not have a pure contributory negligence system. The last clear chance doctrine states that even if both parties were negligent, the party that had the last clear chance to avoid the accident can still be held ultimately responsible for any harm caused. The other type of system is known as a comparative negligence system. Under this system, if a plaintiff was in any way liable in connection with the accident that resulted in his personal injury, he could still recover in a civil lawsuit. However, while this is not a complete bar to recovery, the amount of negligence the plaintiff contributed to his own personal injury will be reduced from the ultimate award. Note that we still it contributorily negligent conduct in a comparative negligence system. We do not use the term comparatively negligent. For example, if plaintiff was injured in bike crash a jury determines that plaintiff is 30 percent negligent, and the jury decided that the total damages were $100,000, then plaintiff will receive $70,000. However, under the law in the Commonwealth, if plaintiff is determined to be more responsible than defendant in connection with the accident, then it would be a complete bar to recovery. This means that if plaintiff is 51 percent or more responsible for the Boston bike crash, plaintiff would not be able to recover any damages in a personal injury lawsuit. However, none of this will matter if the plaintiff and defendant are able to reach a full and appropriate settlement agreement as the parties can dismiss the case upon reaching a settlement and that will often obviate the need for a judge to approve a settlement. Even if the judge is required to approve the settlement in your case, most judges will approve any reasonable settlement upon which the parties have agreed. The only issue that an arise is a settlement that is not in the interests of justice or not agreed to at arms-length, but that should not be a problem when plaintiff is represented by an experienced attorney.